While the first five ingredients play a significant role in the nutritional make-up of your cat’s food, every single ingredient is important. For nearly a decade, tens of thousands of dogs and cats have been eating and thriving on Life’s Abundance foods. We attribute this success to our painstaking attention to detail. Each and every ingredient in Life’s Abundance food is carefully chosen to work with all the others to supply your companion animal with a highly nutritious and perfectly balanced meal every day, every year over a lifetime. What about the foods NOT recalled that are killing pets? 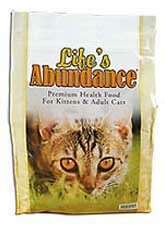 Life’s Abundance foods are veterinarian-formulated with select ingredients help your cat achieve optimum health. We use a “fast-cook” process at low temperatures to help preserve the nutritional value of each and every wholesome ingredient. And we maintain strict inventory controls to ensure the quality and safety of our foods. CALORIE CONTENT: Metabolizable Energy (ME) = 4,065 kcal/kg, 495 kcal/cup (calculated). Amounts are based on the use of a standard measuring cup. more than meeting minimum requirements. •Chicken Meal -Some foods contain chicken meat or chicken parts, which naturally hold a fair amount of water. We prefer to use chicken meal because most of the water has been removed, which makes it a concentrated source of protein. This means that there is a greater "protein content" in one pound of chicken meal versus one pound of chicken meat. That’s why high-quality chicken meal is a key ingredient in Life’s Abundance foods. •Eggs - Eggs are one of nature’s most nutrient-dense foods and play an important role in a balanced diet. They are considered a complete protein source, providing essential amino acids, vitamins and minerals (vitamins A, B, E, K, Biotin, and Sulfur). Eggs also provide healthy fats, such as omega-6 for healthy skin and a glossy coat. •Catfish Meal - Our top-quality fish meal is made by drying the freshest catfish at a low temperature, creating a concentrated, highly-digestible protein source. In addition to being an excellent source of protein, catfish meal provides natural DHA and EPA, the most important of all the omega-3 fatty acids. •Turkey Meal - Turkey is an excellent source of protein and is rich in calcium, potassium, B vitamins, niacin, iron and zinc which promote energy and overall health. Turkey meal is also very digestible and very palatable. CHICKEN FAT - We believe the primary fat source in cat food should be animal based because these fats contain a profile of fatty acids that are easily metabolized and generally more available to the body. Animal fats can vary in quality, so look for a species-specific fat like "chicken fat" (versus "animal fat") to be certain of the kind of fat your cat is eating. •Ground Brown Rice is the entire grain with only the inedible outer husk removed. This whole grain contains manganese, selenium, magnesium, as well as tryptophan and vitamins B1, B3 and B6. ~ Minerals: calcium carbonate, potassium chloride, ferrous sulfate, zinc sulfate, zinc proteinate, iron proteinate, zinc oxide, copper sulfate, manganese sulfate, manganese proteinate, copper proteinate, manganous oxide, sodium selenite, calcium iodate. Pomegranate - Pomegranate contains vitamin C and potassium. The polyphenols in pomegranate (hydrolyzable tannins called punicalagins) are responsible for the red color. FLAXSEED MEAL - Flaxseed meal is the richest plant source of antioxidant lignans and omega-3 fatty acids. Flaxseed meal also has a very high level of highly-digestible protein and essential amino acids. In addition, flaxseed meal contains significant amounts of fiber, vitamin E, folic acid, riboflavin, niacin, vitamin B-6 and is extremely rich in the minerals potassium, calcium and phosphorus. BREWER’S DRIED YEAST - Brewer’s dried yeast is loaded with highly-digestible protein with an exceptional amino acid balance. It also contains an abundance of natural minerals and vitamins, featuring B complex vitamins (except B-12). BEET PULP (SUGAR REMOVED) - Fiber is required in every diet to maintain healthy intestinal tract and proper nutrient absorption. We use beet pulp, which is the fiber from the gray sugar beet (sugar removed). Many studies have demonstrated that beet pulp performs better than many other types of fiber. DOG GRASS - Dog grass contains many nutrients that cats crave … that’s instinct at its best! When cats in the wild consumed their prey, the intestinal tract contained grass and this grass provided necessary fiber and phytonutrients. ALFALFA SPROUTS - Alfalfa sprouts contain an abundance of highly active antioxidants, phytochemicals, enzymes, trace minerals and numerous other living nutrients, which work to support good health and promote proper assimilation of foods. DIRECT-FED MICROBIALS - These ingredients are similar to those found in supermarket yogurts. Direct-fed microbials help support healthy immune and digestive systems. Life’s Abundance contains the following direct fed microbials: Dried Lactobacillus acidophilus Fermentation Product, Dried Lactobacillus casei Fermentation Product, Dried Bifidobacterium thermophilum Fermentation Product, Dried Enterococcus faecium Fermentation Product.